GOOD Magazine came to RTOP looking for a way to engage the crowd at their SXSW launch party for the 2016 GOOD 100, an annual spotlight on individuals around the world who are tackling pressing global issues in extraordinary and innovative ways. This seemed the perfect opportunity to extend our digital expertise into the physical space and apply some experiential techniques we’d been exploring. 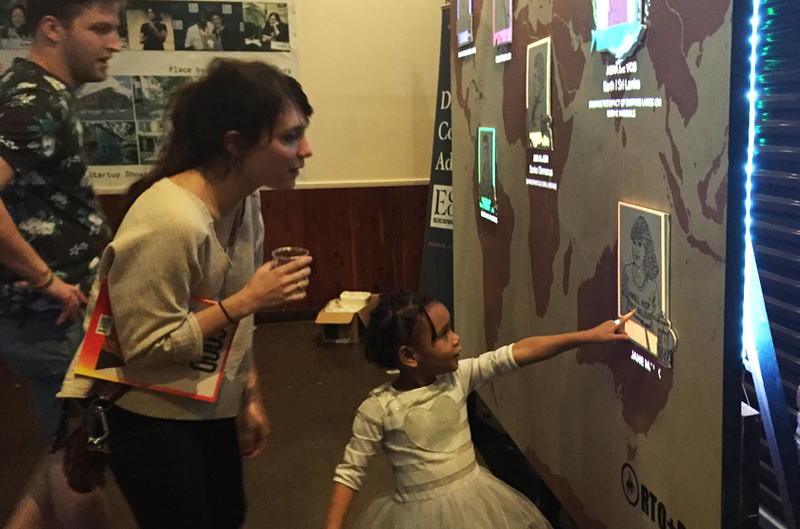 As an anchor to the party, we created a 10’x10’ interactive installation featuring a global map detailing the names, contributions, and locations of each of the honorees. Six showcase features presented a black and white portrait of selected figures which would unexpectedly come to life with color, sound and animation when touched. The technology was rendered “invisible” through the use of a layer of capacitive paint under the map which was wired to an Arduino monitoring the levels of electricity flowing through the circuit. A touch on the map would trigger the corresponding projection-mapped animation on the wall and change the color-coded LEDs behind the map's frame, creating an ambient glow around the installation. With just 12 days to complete this project from concept to execution, I led a team of 3 makers, one developer and one visual designer, to create a unique conversation piece for GOOD’s SXSW crowd and a project unlike any the agency had undertaken. Plus, it was a big hit with the kids.